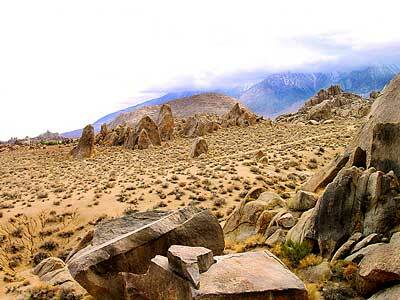 A nice surprise for visitors to Mount Whitney region when they happen upon the Alabama Hills. This cool boulder field lies at the base of the eastern Sierra Nevada mountain range next to the town of Lone Pine, on the way up to Whitney Portal. The infamous area features a drive named "Movie Rd". 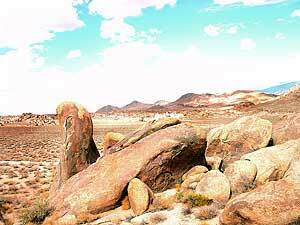 A historical spots for filming old westerns & cowboy movies. Plenty of television commercials & videos have been filmed here as well. 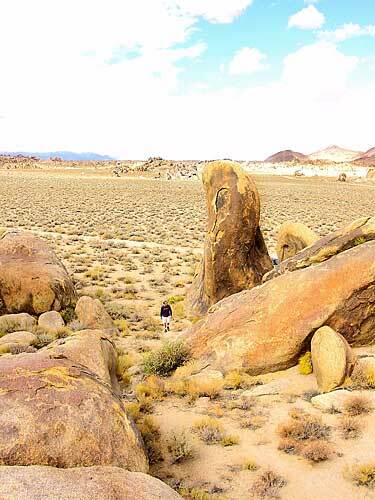 From the Mojave desert, take Hwy.395 North to the small town of Lone Pine . At the only traffic light in town; turn left up Mt Whitney Portal Road; continue up to boulders. MOVIE ROAD, right turn to start exploring. Mant graded dirt roads and areas to park. Inyo National Forest just next door offers granite peaks, pinon pines to Ponderosa pines, Sierra lakes, fishing, hiking, horseback trails. 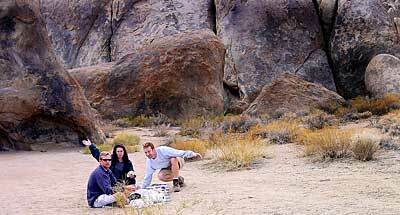 Plenty of camping in the region: from nearby Tuttle Creek & Lone Pine Campground to the steep elevations ascending roads to Cottonwood Lakes camping or Whitney Portal Campground. The drive to the portal is a steep one and you might need your jacket @ altitude 8000 feet.